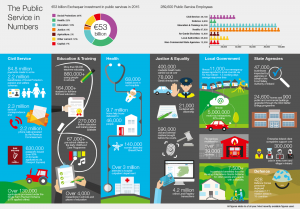 In January 2014, the Government published its second Public Service Reform Plan, covering the period 2014 to 2016. This built on the strong progress made on the first Public Service Reform Plan, published in November 2011. The new Plan placed a particular emphasis on improved service delivery, as well as maintaining the necessary focus on increased efficiency. Just over a year on from the publication of the Public Service Reform Plan 2014-2016, and as part of a specific commitment in the Plan, Minister Howlin today published the first Progress Report on its implementation. The Plan contains more than 230 actions and this Report provides an overview of the progress made across the 13 cross-cutting areas set out in the Reform Plan. It also provides examples of progress and good practice from across the Public Service under these 13 headings. The Minister also thanked all public servants for their contribution to the ongoing recovery. He commented that “their commitment, dedication and efforts have been the most important element in the progress that we have made in building a new Public Service”. The Haddington Road Agreement continues to play a critical role in improving productivity, reducing costs and enabling reform. Watch the new Public Services Cards video!